To call this recipe a healthy snack would probably fall somewhere in the same category as calling that strawberry whipped cream pretzel Jello creation, a salad. But I'm pretty sure I recall my sixth grade home economics teacher, Judy Ludy, pronouncing this treat a healthy after school snack. I do remember it was the first thing I brought home from that middle school kitchen, found deep in the belly of the building, covered in orange and brown laminate everything. Three kitchens, divided by rolling worktables and a row of stoves, we were set free in the land of open flames and sharp knives. A group of five chefs, in royal blue aprons, elbow to elbow in each kitchen. We shared the work, fought over the most exciting parts of the recipe, and whined when someone didn't wash their own dishes. It the end, we each sampled a small square, divided up the rest and tucked it in a flimsy plastic sandwich bag, that we shoved inside that outside pocket of our backpacks, among pencil points and tiny spiral notebooks. By the time we got on the bus, it was a warm misshapen mess that we had to peel from the wrapper, but the joy of tasting that peanut buttery goodness was worth all the wait–while others peeked over green vinyl seat backs to see what they were missing, and what they'd be making when their turn came at the kitchens. * The old-school recipe calls for corn syrup. However, I often swap it out for honey. This makes for an equally gooey, sweet result, with slightly more "teeth stuck together, chew for one minute before swallowing" end results. Stir together sugar and corn syrup (honey) and bring to a boil over medium-high heat. When the mixture begins to bubble (just a nice easy boil around the edges, not a rolling, aggressive boil) remove from heat and stir in peanut butter until melted and smooth. Pour over cereal. Stir to coat and press into an 8 x 8 pan. Cool and cut into bars. It can be stored in the refrigerator, if you want, but I find it best to bring it back to room temperature or else it is really difficult to cut (and chew, for that matter). If you're really wild and crazy, you can melt chocolate bits over the bars. 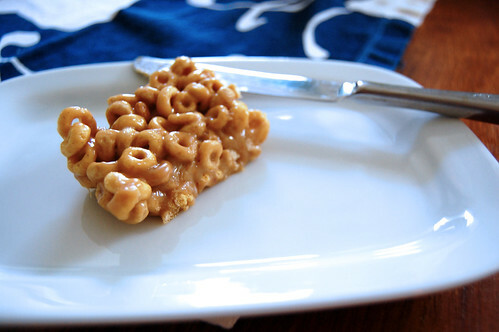 **One more thought: now, after years of making this recipe, I often add the cereal directly to the peanut butter mixture and play with the amount I add. 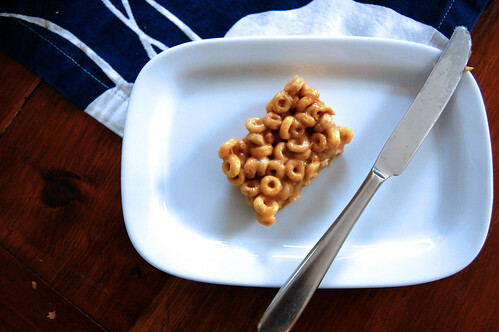 Adding less cereal will obviously give you more of a soft, candy-like result, which is sometimes kind of yummy, too. Very sweet post, your descriptions really brought me back to the days of home economics. I can’t believe you have held onto this recipe for this long, or is it *that* good you have it memorized! : ) You really can’t go wrong with peanut butter can you! Oh, this brings back memories. I used to make this recipe (with corn flakes) for kids when I was babysitting. I might need to go buy some corn flakes. Mrs. Ludy, I remember her! Didn’t she used to wear her glasses on the end of her nose and look over them at us? 🙂 I think she called these O’Henry bars. Thanks for the memory recall. I, too, can now recall the home ec kitchen downstairs… it was one of my favorite classes! We may have to whip some of these up today for old times sake! Oh I so wish I wasn’t allergic to peanuts now.I really miss peanut butter! Hi Molli! And did you remember that she used to get really mad at us if we hit the spoon or spatula against the bowl to get the rest of the batter off? She HATED that! I guess listening to it all day would make you a little crazy! 🙂 Oh and yes, about the glasses! I forgot until you mentioned it. And do you remember that she did all her demonstrations for the recipe at that table with the mirror above her, so that we could see? too funny. ahhhh. memories! so making that. maybe after school today. This cracks me up! You nailed it. Oh, that sounds indulgent! We can’t do nuts at our house so I miss out on all these special treats! I made something very similar in home economics…and it’s so hilarious that something that contained corn syrup was considered “healthy”. I love your posts by the way…simple topic becomes great story…. The sound delicious. You’ve got me remembering my home ec. days from 8th grade with Mrs. Mogk… My first creation was a tuna melt. Too bad I didn’t manage to get it out of the oven without dropping it onto the heating element. We didn’t have a home ec class, but I had Joanne, my childhood babysitter, who gave me glorious snacks including fried cheerios (exactly as it sounds … cheerios pan fried in butter) and cheese sandwiches –grated cheddar mixed with mayo. Molly–What a great description. It uncovered some long forgotten memories of Home Ec! Are you going to make the buckeyes–the peanut butter balls that you dipped in chocolate? Those were my favorite, but obviously less ‘healthy’ for you than the cereal treats. Thanks for the walk down Memory Lane! I used to eat something like this nearly every day in college, except it was made with Special K and seemed to maybe have some marshmallow in it, too. Great washed down with a super-sweet gigantic iced latte. No wonder all-nighters were so easy then. You totally took me back to junior high home ec. class. Thanks for the trip down memory lane and the recipe. Now I’m off to make some “healthy” snacks.